12 Beautiful Fall Wreaths, just in time to help you start planning. I had to stop and check my calendar when I popped into Michael's this week…I thought perhaps, unknown to me, it was actually mid-October and I had just woken up from a bout of amnesia…having slept through all of August and September. If the decorations are an indication, I should have all my trick or treat candy purchased and have some idea of what my table will look like for Thanksgiving. I gave this one that I made last year to my mom…so I need to noodle something new. Since I know I needed a little inspiration, in the off chance that you do to…I rounded up 12 lovely and creative fall wreaths from some talented bloggers…a little ‘fall wreath eye candy'. Kelly at Live Laugh Rowe turned a drop cloth into a wonderful neutral fall wreath…you could add color if you desired, but I do like the ‘calmness' of this neutral wreath. If you feel like getting your ‘power tool' on, this beautiful wood monogram pumpkin would be a fun project. Pop over to Reality Daydreams to get the how to. My friend Robin is so wonderfully creative…and this ‘wood' wreath is one of her creative wonders. 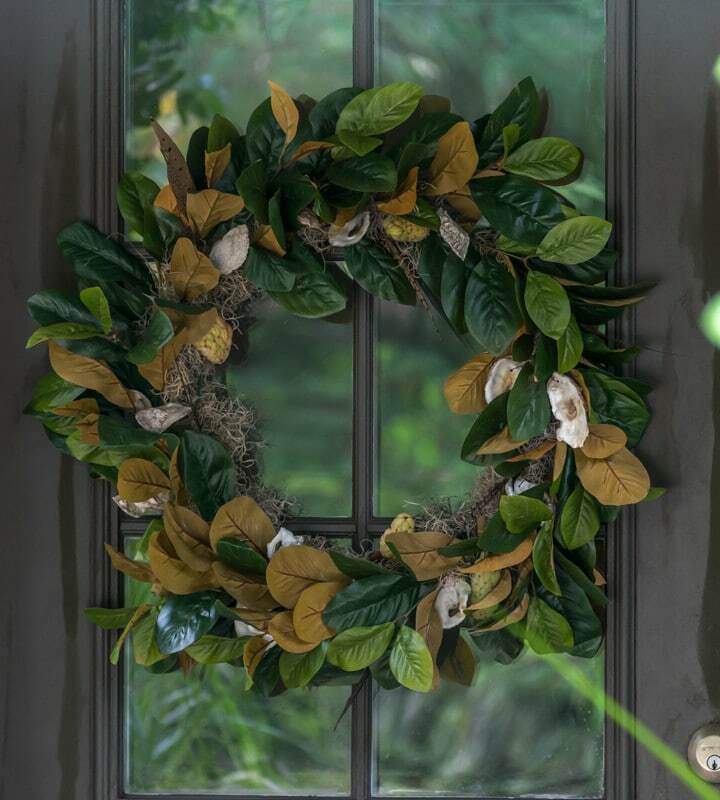 You'll be surprised to find out what she used to make this great wreath…head over to A Home to Grow Old In to find out the ‘secret' ingredient. What a great use of lovely papers to make an unusual fall wreath. Jeannie at Create and Babble created such a lovely and unique wreath. Who says you have to hang a wreath on your front door? How about an olive bucket with lovely pom pom flowers...and switch it up for next season. 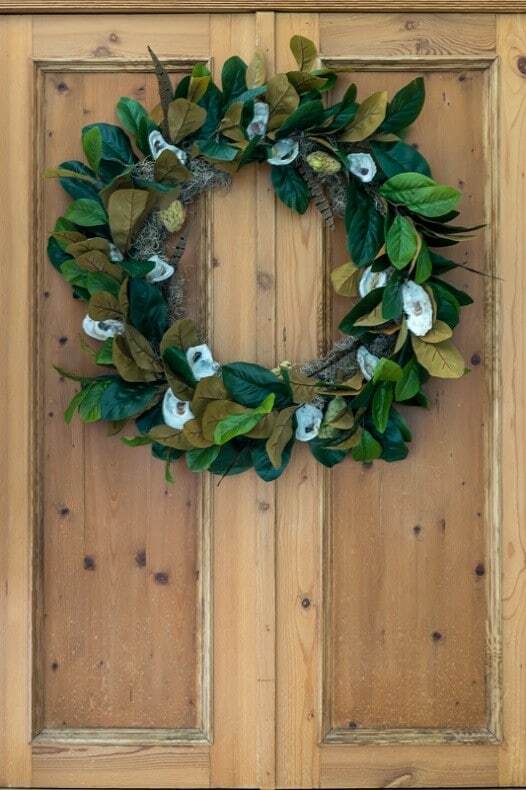 I tend towards the natural, so this Magnolia and Pine Cones wreath is right up my alley. Along the same lines, my friend Patti created a lovely Herbal Harvest Wreath…I can imagine the scent is heavenly and think it will be equally lovely when the herbs dry. How about one more ‘natural wreath'? This simple twig and pine cone wreath from Shauna is just perfect on so many levels. One more from my friend Patti, this colorful felt wreath still feels ‘natural' to me. OK…not solely just a wreath a post, but a creative use of a thrift store plaid shirt…Sarah made the wired ribbon for this simple and traditional wreath. Well, if you needed some ideas for fall wreaths, I hope these 12 beautiful ones will give you a little inspiration. They surely helped me narrow down my thoughts. Feel free to bookmark this page of fall wreaths or pin this image for your future reference. As always love Patti’s wreath examples and the others are sweet too. But that first one you made is super cool… Normally this time of year at our place it’s quail harvesting season which makes me think a wing feathered quail wreath would look neat for fall… It would also probably offend many so probably not a good idea..
Hey Carole, Patti is crazy talented with a wreath…and why would quail feather offend anyone…don’t they lose them naturally? I have misplaced my password to the subcribers library. Help please. Chris, I hope that you received my email with the password! If not, do let me know. What a beautiful selection of front door wreaths you have here. Lots of inspiration. I love the one you gave to your mom. Thanks for including my projects. Can’t wait to see what you create this year. Thanks Patti! And my selection was made all the better for your two beautiful wreaths. Thanks for letting me include them.